Four Houston firefighters died from injuries suffered while battling a major blaze at a hotel and restaurant, mayor's office spokeswoman Janice Evans said. Six other firefighters are being treated at local hospitals. 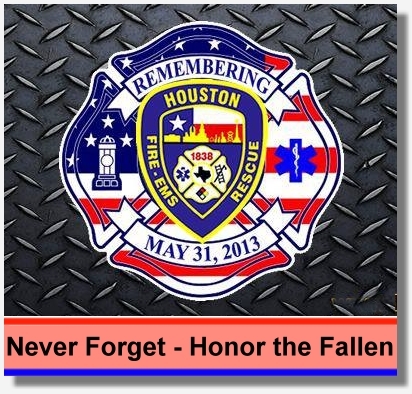 "Houston firefighters mourn the loss of our three brothers and our sister and will forever honor their sacrifices. Our association and the International Association of Fire Fighters are monitoring the conditions of the six injured firefighters and will be assisting them and their families in every way possible. This tragedy underscores the inherent dangers of our profession. Please keep Houston firefighters in your thoughts and prayers." Captain EMT Matthew Renaud (35) of Engine 68. He began his career with the Houston Fire Department in October of 2001 and in addition to Fire Station 68, has served out of stations 51, 39, 83, 73, 37, 60 and 35. Engineer Operator EMT Robert Bebee (41) of Station 51. He began his career with the Houston Fire Department in August of 2001 and in addition to Fire Station 51, has served out of Stations 37, 40, 10 and 48. Firefighter EMT Robert Garner (29) of Station 68. He began his career with the Houston Fire Department in October of 2010 and has served out of Fire Station 68 since. Probationary Firefighter Anne Sullivan (24) of Station 68. She graduated from Houston Fire Department Academy this past April and was assigned to Fire Station 68.